The so-called Frankenstorm knocked out power to the hospital. When the storm's record-breaking tides flooded the basement, where many of the research specimens were kept, the backup generators failed, leaving the 13-story research center in the dark. The mice were inundated. Other cells, tissues, and animals used for medical research died slowly in idle refrigerators, freezers, and incubators. Precious enzymes, antibodies, and DNA strands generated by scientists and stored at temperatures as cold as -80 degrees were also almost surely destroyed. How significant was the loss? The facility houses labs dedicated to research on heart disease, neurodegeneration, and cancer. Some scientists doing doctoral or post-doc research may have been several years into a five- or six-year program, and may have to essentially start over from square one. Some of the mice that were lost had been genetically engineered for use studying melanoma and other diseases, and it could take several years of careful breeding to rebuild the colony. Researchers have to identify a gene to be studied, inject the altered gene into mouse blastocysts, and make sure the offspring can pass the traits along to following generations. "Some mice are unique, they're just made for certain research," one non-NYU researcher said, and there's no way to replace them without starting from scratch. "This does not equate to a loss of life," one NYU source told the New York Daily News, "but it is extremely disheartening to see years of research go down the drain." Researchers and lab workers are frantically trying to save what they can, moving still viable specimens, some in big rolling freezers, to a part of the hospital that now has emergency power. Some of the researchers may have shared their strains of mice with colleagues at other hospitals, who might be able to provide them with replacements. Others, however, will inevitably be forced to start over. Could this have been avoided? Possibly. NYU officials knew the generators were old, and had plans to replace them. Also, researchers in Houston learned the hard way, during Tropical Storm Allison in 2001, that it was dangerous to house vital research materials in a basement that could be flooded in a catastrophic storm. The lesson hit home again in 2005 when Hurricane Katrina's floods killed 8,000 animals at Louisiana State University and thousands more at Tulane University — many of the animals lost were, again, caged in basements. Construction started at NYU's 10,000-square-foot, underground animal facility after Allison, and it opened the year after the similar facilities were flooded in New Orleans. "I talk about disasters all over the world," says Bradford S. Goodwin Jr., director of animal research facilities at the University of Texas Health Science Center in Houston. "I just came back from the Asian conference in Bangkok talking about this, and I just tell 'em, 'Get your animals out of your basement!'" Instant Guide: After Sandy: Is another storm coming? 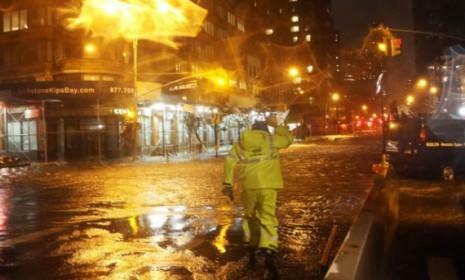 Burning Question: Hurricane Sandy's aftermath: Will rats take over Manhattan?